Translucent Wood Finishes are superior to stain, varnish, oils & wood treatments. Armada allows the teak to breathe, which allows moisture to pass through the coating. Available in original and clear, both in satin and gloss. When applied, the oil alkyd resin based formula penetrates the surface of the wood sealing and protecting it. Subsequent coats bond with the first, building-up to a semi-hard varnish like coating. Because this coating is microporous and relatively flexible, it allows the wood to breathe and flex without causing the coating to crack or peel. 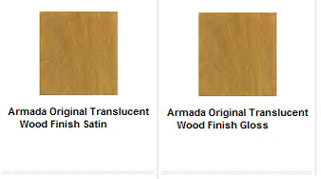 Armada's finished color is similar to varnish, in both the gloss and the satin version; because the product is translucent, the finished color is dependent on the original color of the wood. Use on boat decks, wooden decks, outdoor wooden benches, chairs and other furniture. 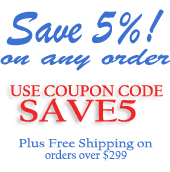 Free Shipping on this product! (48 US States Only). Please see our Shipping page for more information. Covers approximately 500 square feet / gallon; 3 coats needed for proper application - after that, 1 coat per year needed for maintenance. Translucent finishes for interior and exterior wood and teak. Superb to wood oils, stains and varnish. Iron oxide pigments shield the wood against UV sunlight. It is easy to apply, is quick drying, flexible and has superb flow and leveling. Allows the wood to breathe and moisture to escape from the wood. No sanding needed between coats.